Meesaya Murukku movie has finally released after a long wait. This is HipHop Tamizha Aadhi’s debut movie as a Hero and Director. As evident from the trailer, the movie is based on the real life incident of HipHop Tamizha added with some commercial elements. Now let us see the detailed review of Meesaya Murukku movie. The story shows how a middle-class boy becomes a sensation using the support of his friends, online fans, and his dad. Vivek plays as the father of Aadhi and how he remains inspirational for his son. Vivek’s acting is a big boost to the film. Aadhi has played his role decently, truly a great debut. The HipHop Tamizha sensation is clearly seen inside the theaters, no debut hero will get such a response from the audience . The BGM has elevated many scenes and songs are caught too. The whole film feels like a fresh bundle. The co artists have also given their best, VJ Vigneshkanth ( SmileSettai fame ) has done the role of Jeeva – Aadhi’s best friend and his humor have worked big times. Ananth Ram who played the role of Aadhi’s brother has really done a great job ( New Talent found ). Heroine too does a decent performance. Sha Ra ( Temple Monkey Fame ) has really done a good job, he scores in major parts. 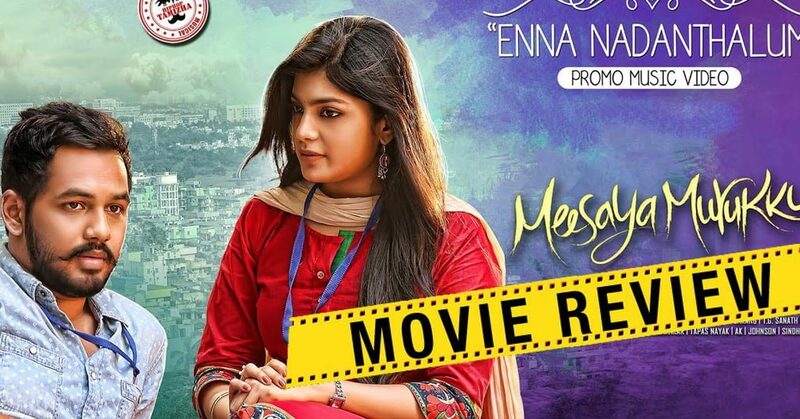 On the whole Meesaya Murukku is a fresh movie from a team of talented youngsters. Though the story is not new, you will enjoy. Neatly packed. The time when ” vaadi Pulla Vadi ” play you will literally get Goosebumps. Go enjoy in theaters .